It's a blistery -42 degrees here in Hoth right now. As you know, the area has been under winter weather warnings all day because of the latest blizzard to hit the area. Snowstorm Echo, the fifth snowstorm of the season, threatens to drop several feet of snow on this already frigid planet. Adding to the misery are the winds which are gusting at over fifty miles per hour, creating snow drifts that you could bury an AT-AT in. There are already two feet of snow on the ground and Snowstorm Echo could add another four to eight feet on top of that. Locals swarmed markets and supply stores this morning, stocking up on everything from blue milk to tauntaun feed. The Sith governor cautioned people to stay off the roads and stay inside. A state of emergency has been declared and all government personnel now have an unexpected three day weekend. Stay tuned with us all morning to hear the latest about school closings and snowfall totals. I'm Eldritch, reporting live from Hoth. Now back to the studio! 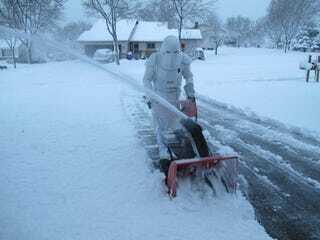 Coming to you live from Hoth! It&apos;s your snowy open thread!